I am happy to announce a schedule of workshops I will be teaching for the beginning months of 2019, with more to follow throughout the year! January 21 – 25, 1- 5 pm. $500: daily materials/supplies included; beverages and snacks provided! Expand your artistic vocabulary by discovering what abstraction means for you and your art practice. From realism-based abstraction to exploring the non-objective, there is great value in shaking up the conversations we have with our work. In this week-long workshop, we will re-visit the elements and principles of composition and design- filtered through an abstract lens – and yes they still apply! Our goal is to discover new approaches to how we source, make, experience and share our work. Each day will include a brief discussion and an exercise to practice a new way of making & seeing, followed by time to work on your own week-long independent project(s). Group discussions and non-threatening critiques included! Participants can work in any type of 2D media - or in small-scale sculpture or assemblage. Supplies for daily projects/exercises will be provided; please bring supplies for your independent project. This workshop is appropriate for creatives of any level! EXERCISE: Drawing & painting media – sourced from reality, then where? Day Five: What do YOU See in That? AND Group Critique of Independent Projects! EXERCISE: Working with a partner, we will co-create a series of small pieces by collaborating and art swapping. Each pair will start with a panel with the same pre-determined starting point. The gallery becomes a mini artist studio for 4 hours. You will receive one on one and group feedback in a safe and inspiring environment! All participants will complete & leave the class with their own original piece(s). All supplies provided for 1 day workshops. Bring anything you’d also like to work with! This cold wax workshop is for both those who are new to cold wax, as well as those who want to further explore the versatility of this popular medium. You will learn about the malleable properties of this additive and subtractive technique, how it differs from encaustic, and how to incorporate it into your mark making toolbox – whether you are a dabbler, drawer, photographer, painter or mixed media artist. Cold wax may be used as stand-alone medium, or mixed with oil paints & other media, to amazing effect. We will discuss traditional and non-traditional tools for application, substrates and surfaces, studio safety and drying agents. Come see how to make this medium work for you in your own art practice, or just to try something new! Introduction to Encaustic Workshop: SO Many Options! Are you curious about encaustic (wax paint applied with heat) and how to use it? Wondering what is involved? Intimidated by the notion of painting with hot wax? Encaustic painting has SO many applications for the artist, but there is a bit of a learning curve when approaching this medium. This workshop will introduce you to this fascinating process. You will learn about the history of the medium – It goes WAY back! - it’s various applications, ways to use it, and what kind of investment it takes to get started. Materials will be provided, so this is a great way to find out about the medium before jumping it. Hopefully, you will want to! For the hands on portion of the workshop, we will focus on the transfer process, with encaustic coated panels prepped & supplied for you. Then it’s up to you to experiment and have fun! The quintessential modern approach to art making – collage and assemblage is everywhere- large and small scale. It is how so many contemporary artists essentially think- what kinds of materials can be combined, and to what surprising effect? Boundaries have changed, and we can look at virtually anything as a potential raw material. 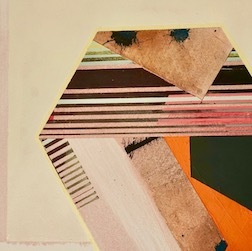 In this workshop, we will discuss a bit of the history of collage/assemblage, what rules of composition STILL apply (yes – even modern art has rules! ), and how to build an assemblage or collage with intention, and make it successful. Material options will be supplied, but please bring found or collected items of your own, objects or materials of interest- ANYTHING that inspires you! That is the first, integral step for this process. Are you interested in taking private art lessons? Classes can be structured to meet your interests as well as your skill level. Want to experiment with several different mediums? Try a one on one exploratory class. Please contact me for more information.